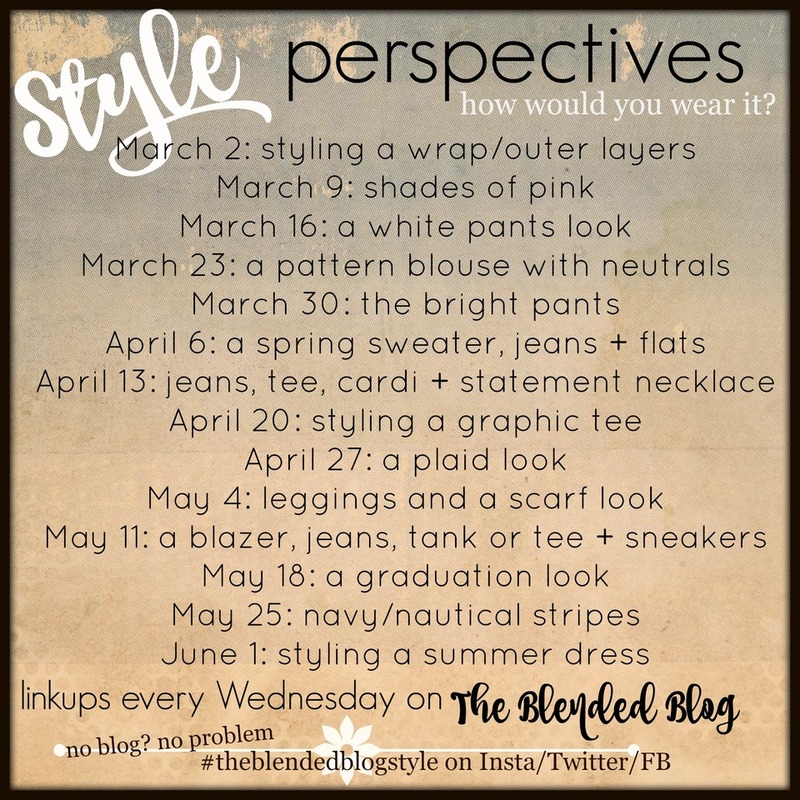 One of our newest Blended Blog contributors, Abbie from Grumbling Grace, is also on a mission to wear everything in her closet. 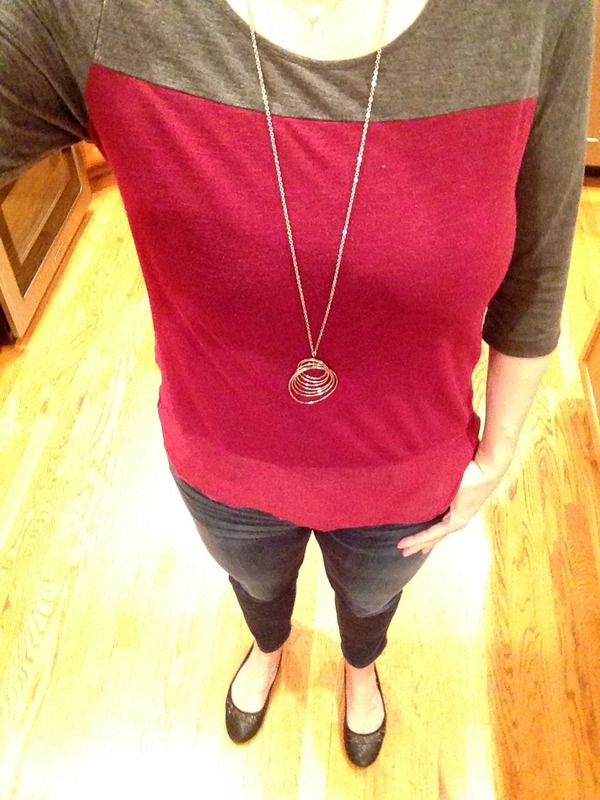 She shares each outfit separately with a little blurb about it, so I thought I'd try that today. You know those days when you think something looks great until you see a picture of it and wonder what you were thinking? That was the theme for this week. My mom, who is temporarily living with us again, assures me that I looked very nice. But she is a mom, and it's part of her job description to compliment me, so I'm dubious. I think some of these outfits are destined for the giveaway pile. As always, I did wear something different from my closet every day. I'm just forgetful when it comes to taking pictures. Must get better. I actually had a few important work meetings this day, so I put on a dress. On a Wednesday. And then every person at my house proceeded to ask me where I was going. Sheesh. Guess I need to wear dresses more often. It was cold so I added tights and boots. Off to the State swim championships. It was windy and rainy outside, but like a sauna at the pool. So much fun to get dressed in the Pacific Northwest! This top has a chiffon hem and is super comfortable - if you're in a sauna. Had to add a heavy coat and boots for the trek from the parking lot. This outfit looked fine in the mirror, but feels kind of frumpy in hindsight. Leggings and tunic sweater from Nordstrom, scarf from Old Navy. I spent the day running errands, and in my town, you see lots of pj's at the grocery store. Seriously. So I was probably the best dressed person there. Still, I'm not loving it. 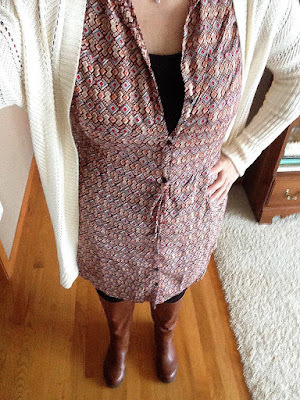 I've been trying to use Pinterest to come up with some outfit formulas, and this looked really cute on the 20 something fashionista I copied it from. Not sure how it translated to 48 - it felt a little....Mr. Rogers? 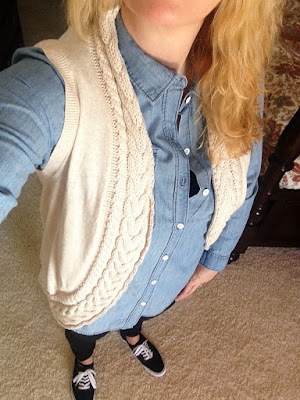 I do love the Piper Street sweater vest that I purchased in December (thanks to some adorable outfits on Katie), and my black ponte pants from Kut from the Kloth are a favorite. Maybe it would work better with the dress from Wednesday. 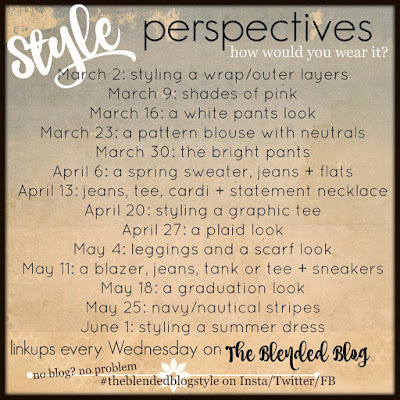 I hope you'll join us next week for The Blended Blog's new series, Style Perspectives: how would you wear it? 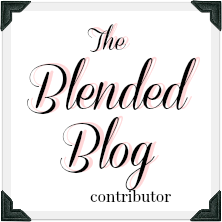 Feel free to jump in on Instagram, Twitter, Facebook, or link up your blog. It's going to be a lot of fun! I think that vest would look cute layered over your dress! I love the outfit you wore to the swim meet - that top is adorable! Thanks Jill - I'll definitely try the vest with that dress next time. I also love your swim meet outfit!! Always love shopping your closet with you Lana!! Cute looks and adore that dress!! Thanks Andrea. There's lots more to come! love that color-block top on you!!! I feel that way sometimes too. Since I work from home, sometimes nobody even sees me all day! Too funny! 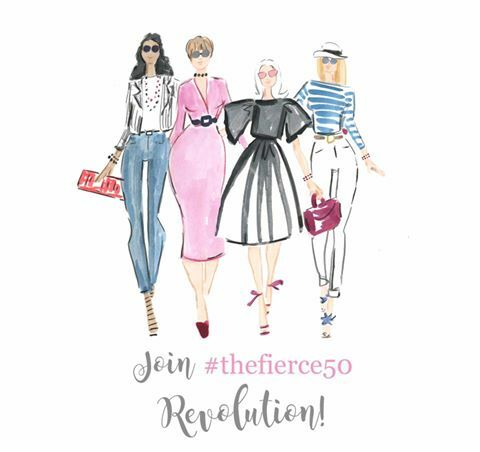 I am writing my Friday post and have a big shout-out to you, my inspiration! Heehee. Love the colour block and the NON frumpy vest combo! I love that you're doing this too. Thanks for the picture blurb idea! I'm a fan of the color block shirt. The second one? My eyes are drawn to that style and they are good for photography! I am happy when clients wear them. I think the best part of wearing everything in your closet is figuring it out - what you love and hate. You have been so diligent on this quest. Thanks Carrie. It's actually been kind of fun! I saw your comment on Living on Cloud Nine about taking vitamins. You said your OB/GYN gave you a formula of vitamins to take to help with anxiety. Would you mind sharing what that formula is? I sent you an email :)! 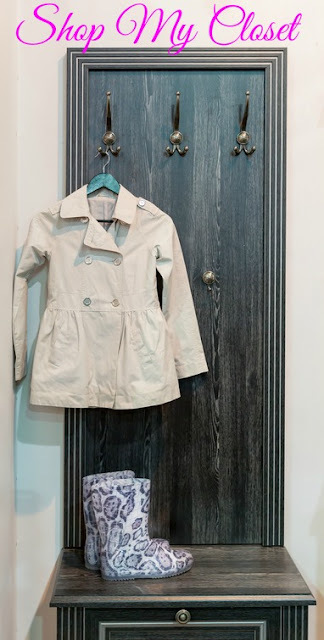 This winter I have been watching what I have worn in my closet and what I have not - and at the end of this winter - what I haven't worn is going for sale or goodwill. I know what you mean about dressing in cold climates - and hot indoors. I struggle on most days. I know what you mean about pictures - sometimes I look at the picture and think - it looked better on the hanger. I haven't decided what to do with the winter clothes I don't wear yet. It's such a bummer to put together a cute outfit and then cover it up with a winter coat! I used to never wear dresses until I started following fashion blogs and now I love them! Especially in the winter when I can layer them up as I usually get cold. That dress looks great on you! I love that striped top with the burgundy scarf, too! Thanks Carrie. I need to wear more dresses! Oh I hear you, Lana. Having spent hours and hours - shall I call them countless hours? - at the pool parked on the benches, I had to become queen of the layers. Pulled them all off as I slouched in the chlorine soaked air and then whipped them back on as we dashed to the car. Gotta love the Pacific Northwest. I love the top you chose to wear! Thanks Kelly. It's such a challenge to get dressed around here, isn't it? I think I've missed some of your posts! I've had a lot on my plate lately (sick, car accident, dental work Ugggh). But anyway, have a great weekend love! I'm sorry life's been rough lately. Hope your weekend was good! I'm a fan of the swim meet top too. And I say, anything you don't love - out with it! So funny about the dress comments :) I love wearing dresses even when I am not working because they are so comfortable. Also, I think that sweater vest would really look cute with the floral dress. I know you didn't care for the striped tunic look, but I think it was cute. Thank you! I'll probably give the tunic another chance, because it's so comfortable! I like them all. 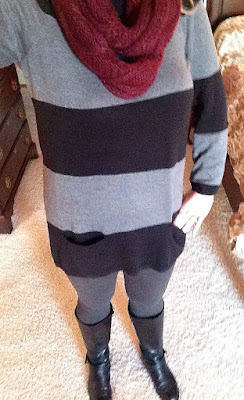 My fav is the gray tunic and tights. Thanks Haralee. I wasn't sure about that one. This week isn't my favorite but you do make your clothes look good! I don't own much with the high school logo on it - just a sweatshirt which is definitely too warm. I saw that you were in Houston - looks like you had a great time! Yay, for keeping the family hopping by wearing a dress. Love it!